Continuing our discussion of trends in the software in the coming months, we definitely need to focus on the principles of business intelligence. It is necessarily one of the key elements of any business strategy. According to the “State of Analytics 2015” study, developed with the contributions of managers from around the world, business analysis, awareness in this area and the ability to draw conclusions from the data demonstrates the close links between the results achieved by businesses and the scope of use of analytical tools for these purposes. 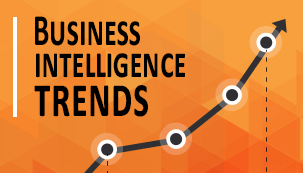 The global Business Intelligence market is now worth more than $ 14 billion and is growing faster and faster. Business intelligence allows you not only to better manage risk but also gives you the ability to detect fraud and to manage increasingly complex processes. It is not surprising that Business Intelligence is becoming the most important part of building the strategy and its implementation in the business and has a huge impact on budgeting and optimizing all business activities. Especially if we take into account the amount and types of data that can be collected and analysed nowadays using the available tools, one can confidently say that not to use these opportunities would be reckless. However, it is not just collecting and analysing the data that make a company successful. This is because the most important trend in Business Intelligence will be combining the data from various sources and exploring the links between them. Today, information about businesses is collected not from one but from many systems and from different areas. Thus, the competitiveness of business analysis systems will be determined by the system’s ability to combine all the data and to help you understand the connections between them. Over the last 5 years, the number of data sources, on the basis of which companies carry out analyses used later in the decision-making processes, have grown slowly – the growth has been estimated at 20%. However, predictions for the next five years suggest a sudden increase in such data by up to 83%. The company’s success is primarily dependent on the scope and relevance of the analysed data. Companies using and investing in a wider range of Business Intelligence solutions demonstrate much better results than other businesses on the market. The most popular trends for investing in the sources of data and in analytics will, in the next two years, include tools and technology (51%), human resources (35%) and training (35%). The market conditions are very dynamic and the business itself is constantly accelerating. Accordingly, there is a growing interest in the possibility of obtaining information as fast as possible and in a flexible way, which allows for carrying out the BI analyses in real time. Better access to valuable information will result in greater competitiveness. It is no wonder that companies focus on expanding the list of objectives and areas where modern analytical tools can be applied. Focusing on automation of business processes and the creation and of course the implementation of new strategies gives by far the best results.